Industry experts expect that the cloud opportunity will be worth over $500 Billion by 2020. Given that massive number, the Microsoft Cloud Solution Provider (CSP) program is helping Partners to take advantage of the tremendous cloud opportunity. The CSP program was launched by Microsoft in 2014, and just a few years later, it’s now considered one of the most important Microsoft programs, due in part to its licensing model, by both Microsoft and its Partners. CSP differs from other programs because it was created to empower and delight not only customers but also Microsoft Partners. The CSP program allows Partners to own customer billing, invoicing, and customers support; and it also creates a fantastic space for Partners to bundle their own Services and IP with Microsoft’s Cloud Solutions like Office365, Azure, etc., all under 1 SKU and shrink-wrapped with the partner’s own company branding. Sounds like a great opportunity, right? However, as more and more partners begin selling CSP, maintaining a strong competitive advantage has become paramount to ensure CSP partner profitability. Success in CSP represents a paradigm shift from the old-school business model of software price wars. The race to the bottom has no good place in the modern Partner strategy. It’s not about price, it’s about your differentiated value-add. And the question remains, can you bring it? So, why is creating a differentiated offer so important? At WPC 2016 in Toronto, during her Modern Profitable Cloud Partner presentation, Jean Sieger from Microsoft and Steve White from IDC quoted a study by IDC stating that the average value-added partner will sell approximately $4.14 of their own offerings for every $1 of Microsoft cloud solutions they sell or influence the sale of. Per IDC, that number bumps up to $5.87 for cloud partners (classified as partners with greater than 50% in cloud revenues). These additional dollars are directly tied to a Partner’s ability to deliver differentiated value-added services and offerings tailored to their customers. Whether that value-add comes from a partner delivering Managed Services, Deployment and Migration Services, Consulting, their own IP or another Partner’s IP, creating a value-add to stand out and resonate with customer demand for solutions to business challenges is paramount to partner profitability. Why? Because partners can productize and charge for these specialized offerings, and as a result can sell their productized offering over and over again. There just aren’t enough margins on software to just sell on price – and customers expect value from their partners. In order to stay competitive, relevant and profitable, partners must differentiate and include unique value add on top of just selling Microsoft’s Cloud offerings. 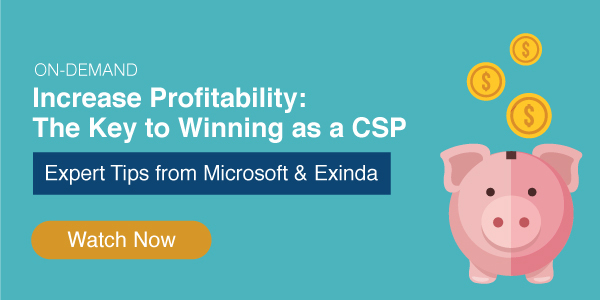 In Feb 2016, Exinda hosted a webinar with David Leblanc, CSP Channel Partner Manager “Increase Profitability: The Key to Winning as a CSP” where Exinda and Microsoft discussed the importance for CSP partners to build unique and differentiated offerings to bring additional value to customers and to ensure increased profitability. Exinda has built a set of application monitoring and control solutions that help ensure Microsoft cloud applications like Office 365, SharePoint, and Skype for Business perform optimally. Exinda’s solutions allow Cloud Partners to include the Exinda IP in the CSP partners’ managed services as unique and differentiated value added offerings. The Modern Microsoft Partner Series: What Solution Providers Need to Know to Thrive in the Cloud and Beyond, Part 1: The Booming Cloud Opportunity. An IDC eBook, Sponsored by Microsoft. 2016 by IDC.